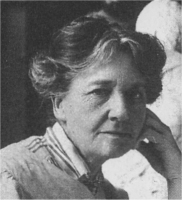 Sophia Rosamond Praeger was the younger sister of the naturalist Robert Lloyd Praeger (q.v. ), she was born in Holywood, Co Down and educated at Sullivan School, the Belfast School of Art and the Slade in London. She also studied art in Paris. 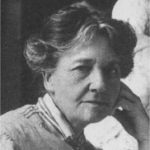 She wrote and illustrated children’s books, but is best known for her sculpture. The Philosopher (which was shown at the Royal Academy) is now in Colorado Springs, U.S.A. Among many other works, her well-loved Johnny The Jig is to be seen in Holywood (between the maypole and the Priory); the Causeway School, near Bushmills, has her Fionnuala the Daughter of Lir. She also modelled figures for such diverse bodies as the Northern Bank, the Carnegie Library on the Falls Road and St Anne’s C. of I. Cathedral, Belfast. 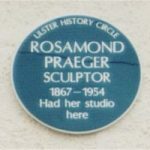 She was President of the Ulster Academy. She received an honorary MA from Queen’s University in 1927, and in 1939 was awarded the M.B.E. Her work is included in the permanent collections of the Ulster Museum and the NGI. 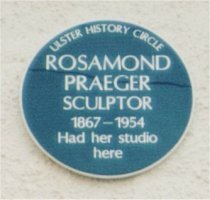 Location of plaque:Hibernia Street, Holywood, Co. Down.